The Middle States Visitation Team members will be on campus during March 25-27, 2019 to conduct a site visit as part of the reaccreditation process. The six members of the visitation team will conduct interviews with Bloomsburg University’s administrators, division and/or department heads, faculty, staff members, and students individually and in group meetings. Middle States institution wide accreditation is required by the U.S. Department of Education. This accreditation is necessary for Bloomsburg University and its students to be eligible for any form of financial assistance from the Federal Government, including grants, scholarships, and federally guaranteed student loans. 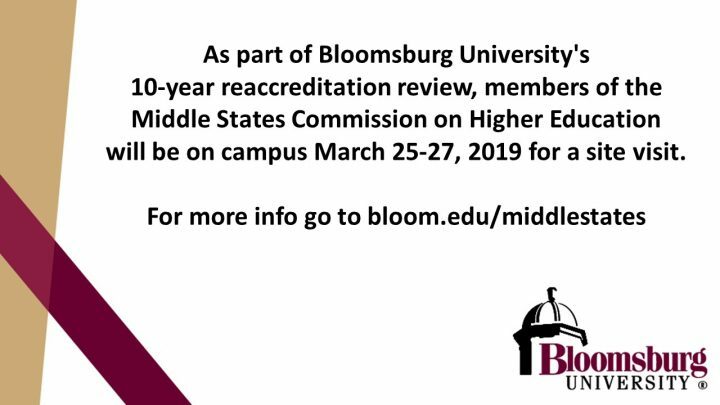 Bloomsburg University’s Middle States Self-Study Report for Reaffirmation of Accreditation and the Evidence Roadmap are available at http://intranet.bloomu.edu/middlestates.